I am happy to discover that you are all so excited to get the Whiff of Joy / Elisabeth Bell summer stamp kit. And I can assure you that I was equally excited to play with my very first stamp from the set yesterday :) I will show you the card I made on monday, together with the wonderful Whiff of Joy Design Team (who already produced the most stunning creations). So stay tuned! Today I want to show you a card I made without using any stamps at all. A close friend asked me to do a card for the grandmother of her husband, who turned 85. I had the perfect paper in my stash from K & Company (Life's journey). It has a beautiful texture and features the most wonderful flowers and colours. Nonna = grandmother in italian ( I love my online translator ;). I designed it on the computer and cut it with Spellbinders tags trio. 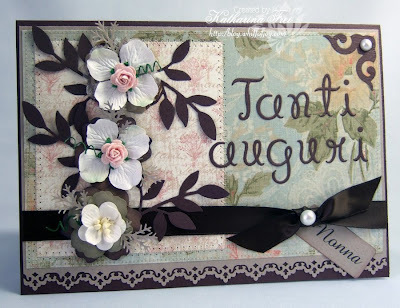 "Tanti Auguri" means congratulations, I did it with my Cuttlebug "fancy pants" alphabet. The border is done with a Fiskars punch. I did the corner with a EK Success punch and added a half pearl. The below photo also shows the texture of the paper quite well. Nonna = Großmutter auf Italienisch (Ich liebe mein online Übersetzungsprogramm). Ich habe es am Computer designed und mit Spellbinder's tags trio ausgestanzt. "Tanti Auguri" bedeutet "Herzlichen Glückwunsch". Ich habe es mit meinem Cuttlebug Alphabet "fancy pants" ausgestanzt. Die Verzierung in der Ecke ist mit einem EK Success Punch gemacht, ich habe noch eine Halbperle aufgeklebt. Auf dem oberen Foto könnt ihr die Textur des Papiers recht schön sehen. I composed the flowers from several individual items. Prima Flowers, flowers from a Making Memories Blossom and Button jar, little roses sent to me from my friend Jacqui, leaves done with a Martha Steward punch and a SU/Sizzit die. Jacqui bekommen habe, Blätter (gemacht mit einem Martha Steward punch und mit einer SU/Sizzit Schneideschablone). I also added a huge flower on the outside of the envelope. 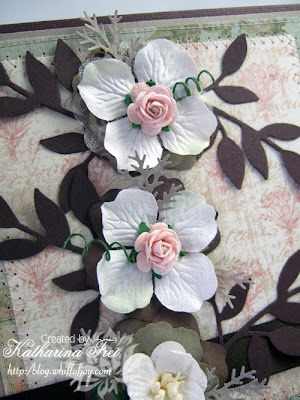 The largest of the flowers is done with a Woodware embossing flower punch. Ich habe auch eine große Blume aussen am Kuvert angebracht. Die größte davonist mit einem Woodware embossing flower punch gemacht. 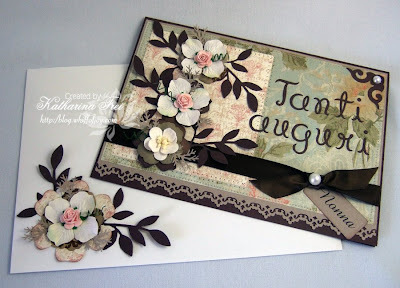 Ohhhh Katharina,what a beautiful card,l love the papers and colours. Such gorgeous colour and beautiful detail! deine karte ist Perfetta per la Nonna. Katharina my "Summer Kit has been delivered this morning!!! I cannot thank you enough for this sensational service. Thank you. Its more than I ever expected delicious in fact :D Have a fab weekend I'm off to play. I'm so excited i nearly forgot to say what a fab card you have made. 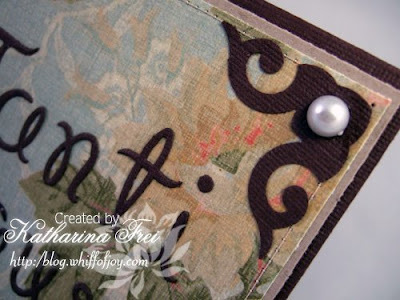 Such a classic card-I too love K&Company and the faded elegance of this paper is perfect.I always admire your use of punches too!The envelope provides the perfect finishing touch. 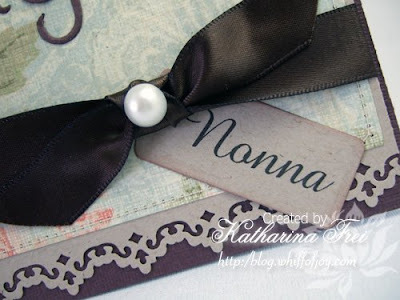 This is gorgeous Katharina, love the vintage feel and beautiful colours! Wow, this is stunning! I love the color contrasts. Wow, so gorgeous!!!! !